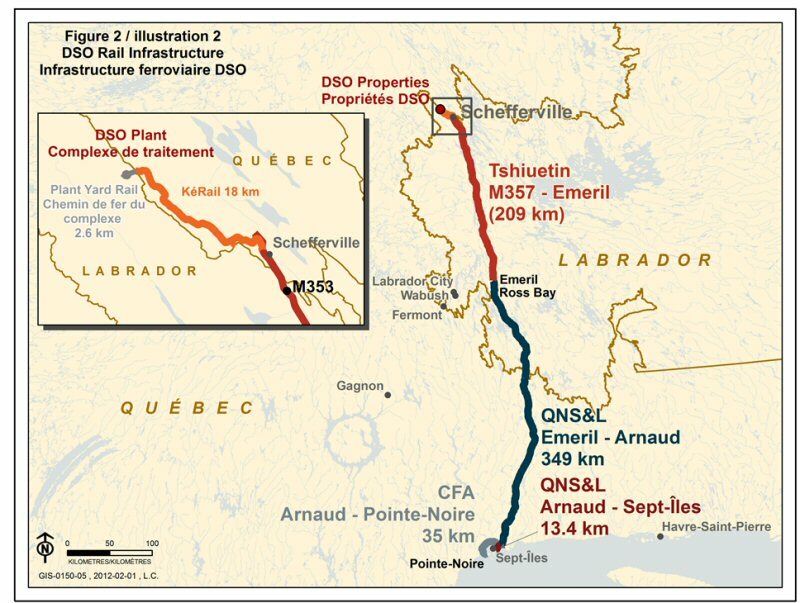 New Millennium Iron Corp. ("NML" or the "Corporation") (TSX VENTURE:NML) updated on the progress to date of its direct shipping ore project ("DSO") and the planned start-up schedule of production by Tata Steel Minerals Canada (TSMC), a joint venture between NML and Tata Steel, in 2012. 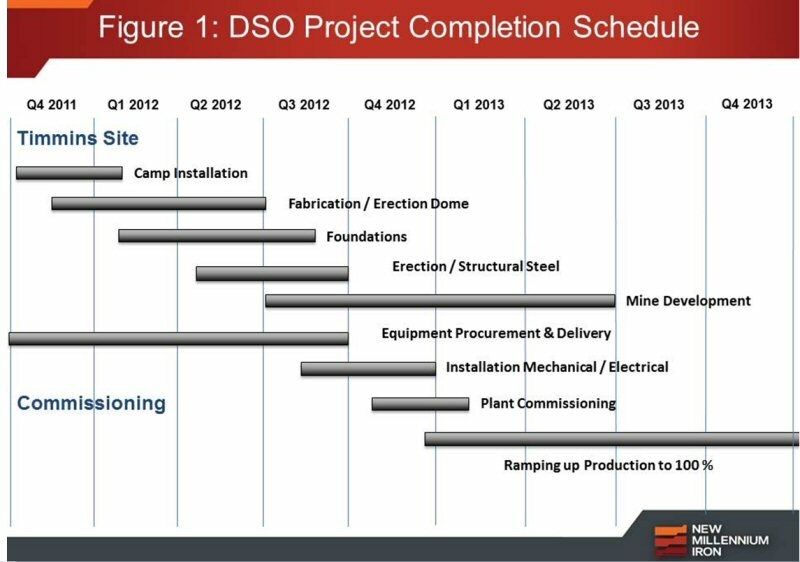 As per the attached schedule (Refer to Figure 1), the installation of the equipment is expected to be completed in Q4, 2012 followed by operation start up and ore production by year end. Dean Journeaux, President & CEO of NML, said, "I am pleased to note that we are on track to move our first train to the Port before the end of this year. TSMC has not only ordered most major equipment, it has also awarded the major construction contracts. 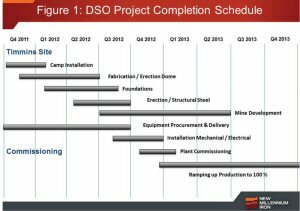 The first shipments of the DSO products will be an important milestone in NML's goal to become a significant producer of iron ore in this decade." A rigid frame structural dome (Refer to NR 11-34, November 22, 2011) is being fabricated at the manufacturer's plant. Pre-cast concrete foundations have been cast and are being delivered to the site. The dome erection is expected to be completed in Q2, 2012. Referring to Figure 1, the installation of mechanical and electrical equipment is expected to start in Q3, 2012. The equipment will be progressively commissioned to enable starting of production before year end. Mine preparation work is expected to begin in Q3, 2012. 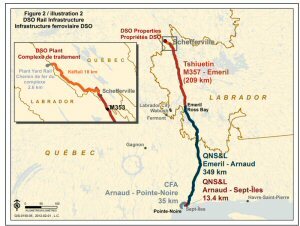 KéRail: 18 km long spanning from the Timmins Yard to Tshiuetin Railway (TSH) will be built by and operated by an Independent Rail operating company. An MOU has been signed with an Operator and final agreement is being negotiated. The construction is expected to start in Q2. TSMC has signed an MOU to haul of its ore from Schefferville to Emeril Junction by TSH. Final agreement will involve financing of TSH's track rehabilitation program. QNS&L: A life of mine tariff agreement has been signed with QNS&L to haul ore train from Emeril to Arnaud Junction (Refer to NR 12-05, January 30, 2012). Rail cars are under fabrication and will be delivered progressively in Q3. TSMC is negotiating with operators to handle its ore dumping, stockpiling and shiploading at Sept-Iles. TSMC has an agreement with the Sept-Iles Port Authority (SIPA) for handling its ships over SIPA's docks. (Refer to NR 10-01, February 16, 2010). The Corporation controls the emerging Millennium Iron Range, located in the Province of Newfoundland and Labrador and in the Province of Quebec, which holds one of the world's largest undeveloped magnetic iron ore deposits. In the same area, the Corporation is also advancing its DSO Project to near term production. Tata Steel Limited, one of the largest steel producers in the world, owns approximately 27% of New Millennium and is the Corporation's largest shareholder and strategic partner. Tata Steel has exercised its exclusive option to participate in the DSO Project and has a commitment to take the resulting production (see news release 10-16 dated September 14, 2010). Tata Steel also has exercised its exclusive right to negotiate and settle a proposed transaction in respect of the LabMag Project and the KéMag Project (see news release 11-09 dated March 6, 2011). The Millennium Iron Range currently hosts two advanced projects: LabMag contains 3.5 billion tonnes of Proven and Probable reserves at a grade of 29.6% Fe plus 1.0 billion tonnes of Measured and Indicated resources at an average grade of 29.5% Fe and 1.2 billion tonnes of Inferred resources at an average grade of 29.3% Fe (see news release 06-13 dated July 5 2006 and news release 07-11 dated July 17, 2007); KéMag contains 2.1 billion tonnes of Proven and Probable reserves at an average grade of 31.3% Fe, 0.3 billion tonnes of Measured and Indicated resources at an average grade of 31.3 % Fe and 1.0 billion tonnes of Inferred resources at an average grade of 31.2% Fe (see news release 09-01 dated January 16, 2009). NML's DSO project contains 64.1 million tonnes of Proven and Probable Mineral Reserves at an average grade of 58.8% Fe, 8.1 million tonnes of Measured and Indicated Mineral Resources at an average grade of 58.8% Fe, 7.2 million tonnes of Inferred Resources at an average grade of 56.8% Fe and about 40.0 - 45.0 million tonnes of historical resources that are not currently in compliance with NI 43-101 (see news release 09-03 dated February 11, 2009, news release 09-05 dated March 4, 2009, news release 09-16 dated December 9, 2009 and news release 10-12 dated July 8, 2010). A qualified person has not done sufficient work to classify the historical estimate as current mineral resources or mineral reserves, the Corporation is not treating the historical estimate as current mineral resources or mineral reserves and the historical estimate should not be relied upon. The Corporation's mission is to add shareholder value through the responsible and expeditious development of the Millennium Iron Range and other mineral projects to create a new large source of raw materials for the world's iron and steel industries. For further information, please visit www.NMLiron.com, www.tatasteel.com and www.tatasteeleurope.com. This document may contain "forward-looking statements" within the meaning of Canadian securities legislation and the United States Private Securities Litigation Reform Act of 1995 These forward-looking statements are made as of the date of this document and the Corporation does not intend, and does not assume any obligation, to update these forward-looking statements. Forward-looking statements relate to future events or future performance and reflect management of the Corporation's expectations or beliefs regarding future events and include, but are not limited to, statements with respect to the estimation of mineral reserves and resources, the realization of mineral reserve estimates, the timing and amount of estimated future production, costs of production, capital expenditures, success of mining operations, environmental risks, unanticipated reclamation expenses, title disputes or claims and limitations on insurance coverage. In certain cases, forward-looking statements can be identified by the use of words such as "plans", "expects" or "does not expect", "is expected", "budget", "scheduled", "estimates", "forecasts", "intends", "anticipates" or "does not anticipate", or "believes", or variations of such words and phrases or statements that certain actions, events or results "may", "could", "would", "might" or "will be taken", "occur" or "be achieved" or the negative of these terms or comparable terminology. By their very nature forward-looking statements involve known and unknown risks, uncertainties and other factors which may cause the actual results, performance or achievements of the Corporation to be materially different from any future results, performance or achievements expressed or implied by the forward-looking statements. Such factors include, among others, risks related to actual results of current exploration activities; changes in project parameters as plans continue to be refined; future prices of resources; possible variations in ore reserves, grade or recovery rates; accidents, labour disputes and other risks of the mining industry; delays in obtaining governmental approvals or financing or in the completion of development or construction activities; as well as those factors detailed from time to time in the Corporation's interim and annual financial statements and management's discussion and analysis of those statements, all of which are filed and available for review on SEDAR at www.sedar.com. Although the Corporation has attempted to identify important factors that could cause actual actions, events or results to differ materially from those described in forward-looking statements, there may be other factors that cause actions, events or results not to be as anticipated, estimated or intended. There can be no assurance that forward-looking statements will prove to be accurate, as actual results and future events could differ materially from those anticipated in such statements. Accordingly, readers should not place undue reliance on forward looking statements.